While Southern Hog and Boar hunting usually requires the hunter to take the first Hog that he sees, High Adventure Ranch encourages hunters to go for the truly impressive kill. Hunters are free to take the Hog of their choice, but we discourage killing Russian Boar under 200 pounds and Razorback Hogs under 150 pounds. Most Boar hunters who have been to our ranch find our philosophy of hunting Wild Boar far more exciting and rewarding than anything they have experienced before. As one of the smartest animals on the planet, Wild Boars or Hogs represent one of our most exciting hunts at the ranch. Although Boars do not possess great eyesight, they have a keen sense of smell and very fiery attitude. In fact, they have a reputation for wanting to hunt you as much as you want to hunt them. Combine this aggressive nature with the fact that boars have a very thick breast plate and many hunters find that they need multiple shots to take this animal down. Some of our guests who are familiar with hunting Wild Hogs (usually from previous hunting in the southern part of the country) may find that Hog hunting at our ranch is a totally new experience. 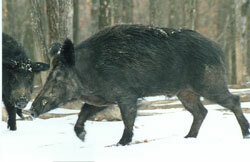 We offer several methods of Boar hunting to fit the needs and interest of every hunter here at High Adventure Ranch. We never use horses because they tend to flush the game too far afield and while some Boar hunters like to use dogs, we find that they tend to attack each Hog that they come upon and often suffer excessive blood loss from wounds and cuts inflicted by the Hog. The use of dogs also does not allow the hunter to be selective with his hunting. For more information on our Boar and Hog Hunts, please call (314) 209-9800 or fill out our contact form. We have a full website dedicated to our Trophy Wild Boar Hunts, check it out now.